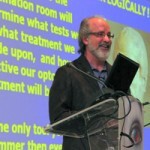 "After 14 years in a primary care practice, I decided that I wanted to get into vision therapy. I signed up for Dr. Sanet’s Seminar Series on the advice of a friend who has a very successful VT practice. It was the best investment I ever made! I am now able to provide my patients with therapy that is based on the latest research in neurology and vision. Don’t try to start a career in vision therapy without first taking this course! Believe me, it is money well spent!" Piaget’s theory of child development with an emphasis on how it relates to the optometric examination, academic learning, and vision training.